I had a little giggle when I read this week’s article from Liz Seymour for the Wider Angle. She uses the words “I won” when referring to a battle small disagreement with her husband, and I was relieved that we are not the only family that has the winning/losing sentiment sometimes. I give Liz a lot of credit because when baby #2 arrived on the scene in the James household, I basically gave up on making dinner entirely. My love for cooking only extends to a clean, quiet kitchen – which is almost never around here. Now that the kids are bigger, I’ve taken to cooking more (which my husband appreciates soooooooo much) – and sometimes I forget about my crockpot! Thanks for the reminder and tips Liz! I’ve been married for nearly twelve years now, and it’s truly been delightful. Of course, my darling husband has his quirks (I won’t go so far as to say faults). One of them involves fire hazards and household appliances. He obsessively checks the oven and stove multiple times before he goes to bed, and the coffee pot before he departs the house, even though it turns off by itself. If it’s not unplugged, he’s not satisfied. So it was an uphill battle to try and persuade him that I needed a crock pot. Finally, 11 years in, I won. While I know there are plenty of cookbooks out there devoted to the subject, I find that so many of them contain recipes that are built on the cream of ___ soup foundation, or something else equally retro and unhealthy. Thanks to an obsessive-compulsive crock pot user who decided to use it every day for a year and chronicled her use on a blog, I have discovered that a huge number of recipes can be adapted to use in the crock pot. The blog is crockpot365.blogspot.com. A couple of other sites have been recommended to me as well, so I look forward to checking out Taste of Home and Mels Kitchen Cafe. 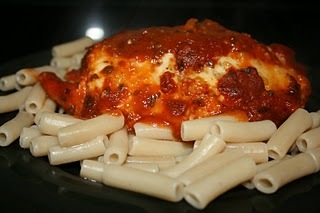 And one of my personal favorites, a crockpot version of Chicken Parmesan! 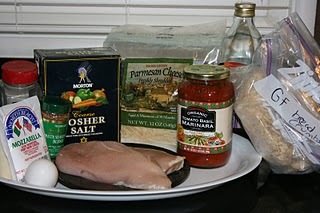 Pics from the crockpot365 website – yummy!